The Foreign Office has apologised for a “foolish” document which suggested the Pope’s visit to the UK could be marked by the launch of “Benedict” condoms. Called “The ideal visit would see…”, it said the Pope could be invited to open an abortion clinic and bless a gay marriage during September’s visit. The Foreign Office stressed the paper, which resulted from a “brainstorm” on the visit, did not reflect its views. You know, perhaps the Vatican ought to take up the Foreign Office staffer on the idea — developed in the midst of a “brainstorm” no doubt aided by Pink Floyd’s The Wall and a healthy dose of blotter paper — of Pope-banded prophylactics. After all, what could better convince someone of the merits of abstinence than a condom wrapper with this guy’s face beaming back at you? On the other hand, Pope condoms could have the alternate effect of convincing people to do away with protection all together, in which case, yay! more potential Catholics! As for the other stuff, well: if you’re going to go that far in asking the Vatican to renounce hundreds of years of church dogma, then why not go all out and try and get Benedict to perform an abortion himself — and to gay marry the Archbishop of Canterbury? This entry was posted in Catholicism. Bookmark the permalink. 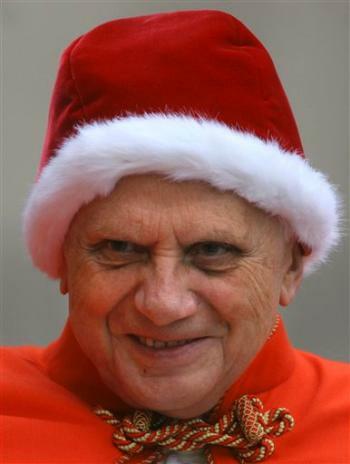 I just found out today (reading Wikipedia) that the word "preservative" MEANS "condom" in a number of European languages.Emperor Palpatine looks to be in the Christmas spirit, by the way.